Traditional Japanese architecture is best known for its extreme minimalism, as exemplified by the austere but elegant simplicity of the classic tea house and perfected at Katsura Rikyu Imperial Villa in Kyoto, which is considered the quintessence of Japanese taste. 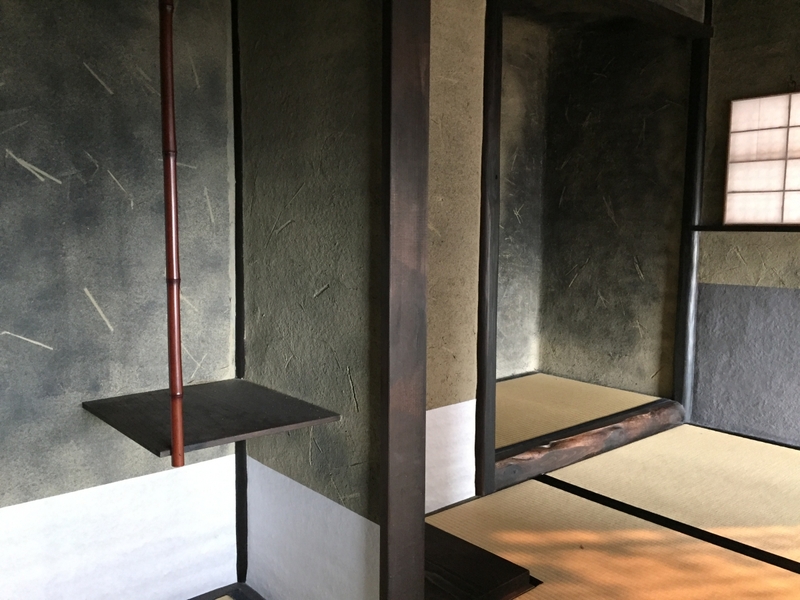 The spare interior of a teahouse on display at the Mori Art Museum. But the Japanese architectural aesthetic is certainly not all about earthen walls, simple bamboo lattices and plain washi paper screens. At the other extreme is an aesthetic that celebrates extravagance, intricacy, even garishness, and reflects the same horror vacui, or fear of white space, that can be seen in diverse artistic styles, ranging from the arabesques of Islamic art to the floral designs of William Morris. In Japan, this aesthetic has its ultimate expression in cultural treasures such as the Yomeimon Gate of the Toshogu Shrine in Nikko, which is covered with more than 500 carvings. 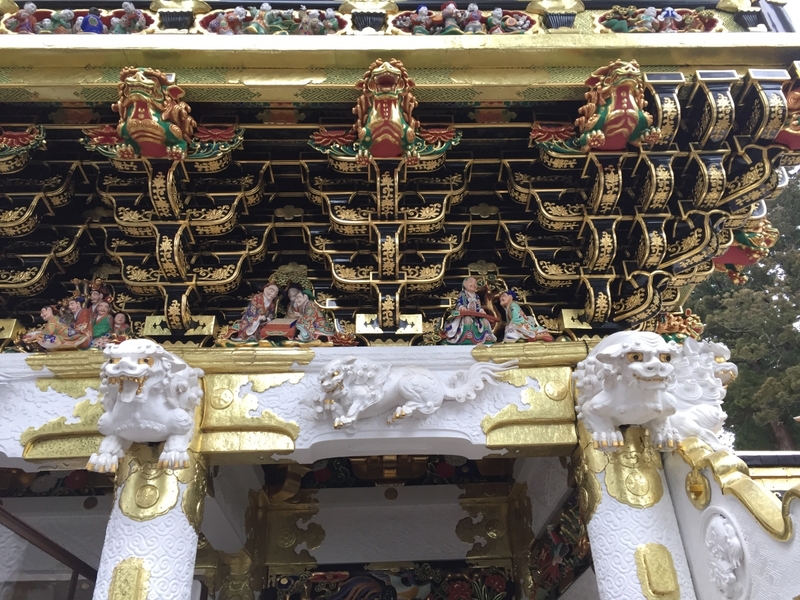 A section of the recently renovated Yomeimon Gate, which is a national treasure. This love of the ornate is also reflected in everyday objects, from the brightly colored exquisite designs of Imari porcelain to the lavishly decorated mikoshi, or portable shrines, used in festivals. 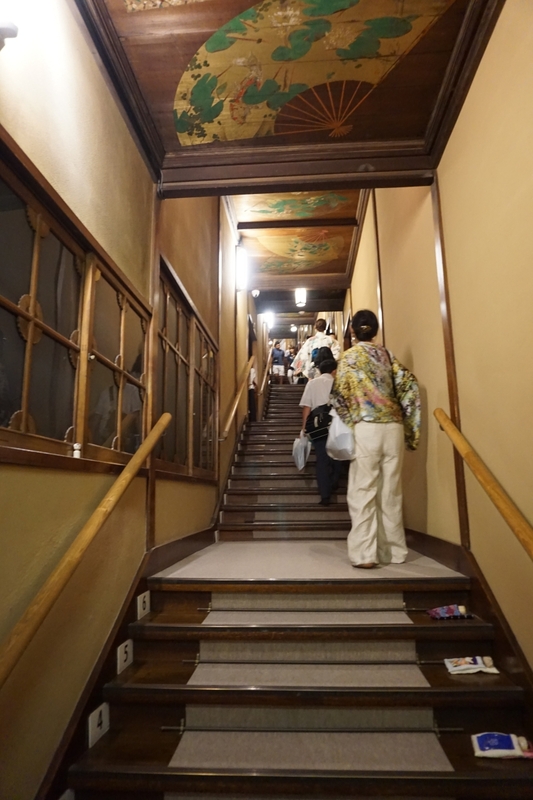 The Hyakudan Kaidan, which means “Stairway of 100 Steps,” is in an old wooden building within the hotel complex that was built in 1935. It is the only wooden building of the original Gajoen that survives today and has been designated a tangible cultural asset by the Tokyo government. Visitors climb the 99 steps of the Hyakudan Kaidan. Although the word “hyakudan” means “100 steps,” the Hyakudan Kaidan, in fact, has only 99 steps. One theory for this anomaly is that traditionally, 100 was considered a number fit only for the emperor and therefore presumptuous for any ordinary person to use, while 99 was considered a lucky number. The staircase was not originally called “Hyakudan Kaidan” and it is not known how or when the name came into use. 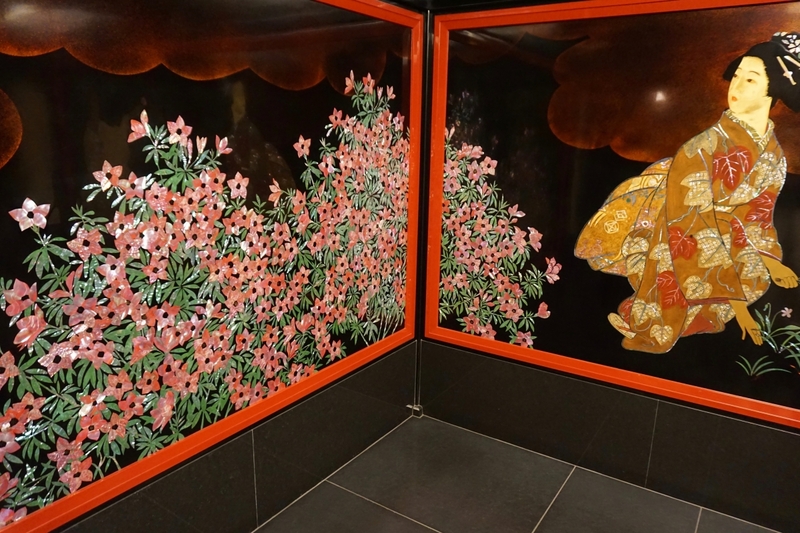 There are seven lavishly decorated rooms on both sides of the steep Hyakudan Kaidan stairway, each one adorned with paintings by different leading Japanese artists of the early 20th century. 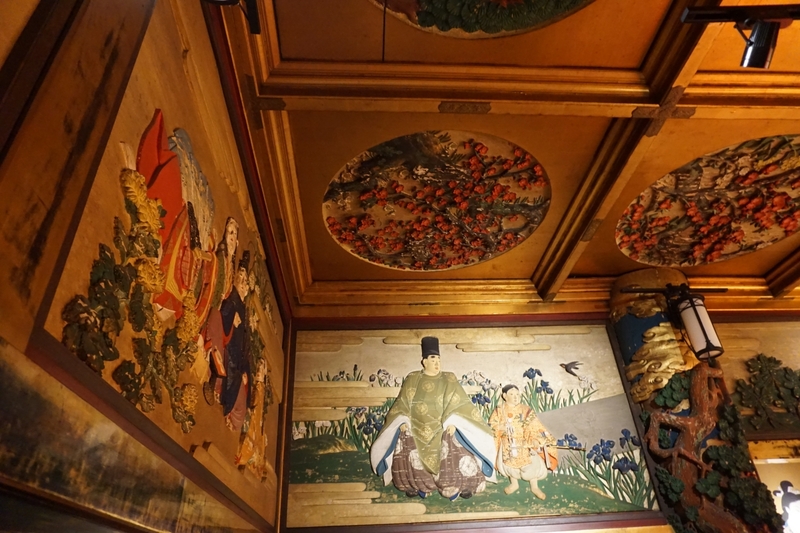 One of the most lavishly decorated rooms, the Gyosho-no-ma is covered in paintings and sculptures by famous artists in early 20th century Japan depicting popular legends as well as ancient court lifestyle. This section of the current Gajoen Hotel – a mammoth concrete structure – was part of the original restaurant, Meguro Gajoen, that was built by Rikizo Hosokawa in 1931 and became the foundation for the current complex. The ceiling of the Gyosho-no-ma is covered in carvings made of Lauan, or Philippine mahogany. What makes this building particularly interesting to me, apart from the luxurious decor, is the rags-to-riches story of Hosokawa’s life. Originally from Ishikawa prefecture, in the north of Japan’s main island, Honshu, Hosokawa came to Tokyo as a youngster and began his career as an employee of a public bathhouse where his job required scrubbing customers’ backs, among other things. He worked hard and diligently, eventually acquiring a bathhouse of his own and dabbling in real estate, which formed the basis for his future riches. Perhaps in a reflection of his own humble beginnings, when Hosokawa had amassed sufficient wealth to build a high-end restaurant, he decided to open its doors not just to wealthy aristocrats but to ordinary people as well. 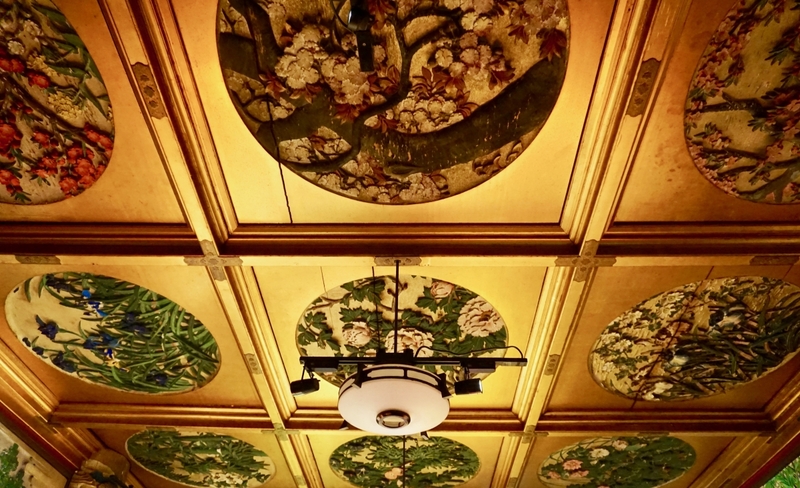 Hosokawa built Gajoen to be a place for aristocrats and commoners alike to enjoy the lavish meals and exquisite art that was in his time, still the privilege of the upper classes. He seems to have spared no cost in decorating Gajoen (hence the name “Palace of the Dragon King”). In addition to commissioning famous painters to cover the walls, ceilings and fusuma (sliding doors) of the seven rooms, which were originally used for wedding banquets, Hosokawa employed master sculptors to carve intricate pillars out of expensive wood, some of which was even shipped from Brazil, as well as highly skilled craftsmen to create exquisitely carved ranma (dividers between sliding doors and the ceiling). 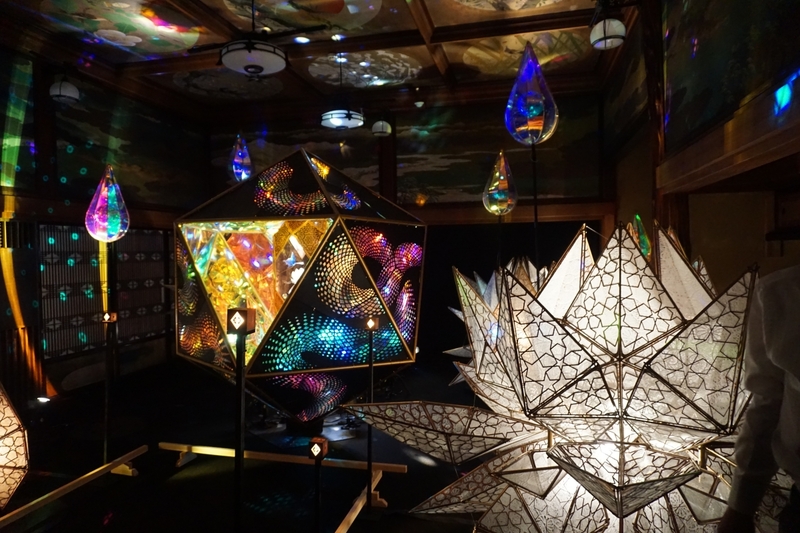 The ongoing exhibition at the Hyakudan Kaidan, “Wano Akari,” or “The Aesthetics of Japanese Illumination,” brings together the elaborate art of the early 20th century that Hosokawa favored with a diverse range of work by contemporary Japanese artists focusing on the theme of light. The paintings against the walls are by Hidenori Majima, who specialises in nihonga (paintings using traditional Japanese materials). These Nebuta lanterns (lantern floats used specifically for the Nebuta Festival in Aomori) depict scenes from the Tale of Princess Kaguya. The juxtaposition of traditional paintings, sculptures and craft with contemporary art is at times pleasing and often intriguing, but does not always work here, in my view. In some rooms, the contemporary artwork is so dominant it is hard to see the room’s original decor, which seems to defeat the purpose of having the exhibition there. 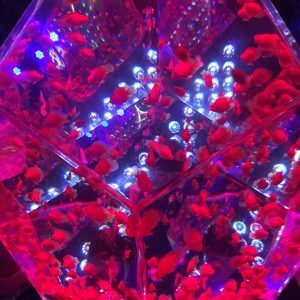 This enormous flower arrangement by Naohiro Kasuya makes it difficult to see what the original room looks like. The lighting art has turned this room into a discotheque. Nevertheless, the “Wano Akari” exhibition is a great opportunity to see both the historic building as well as discover the many talented artists of today whose work would be of interest regardless of where it is displayed. 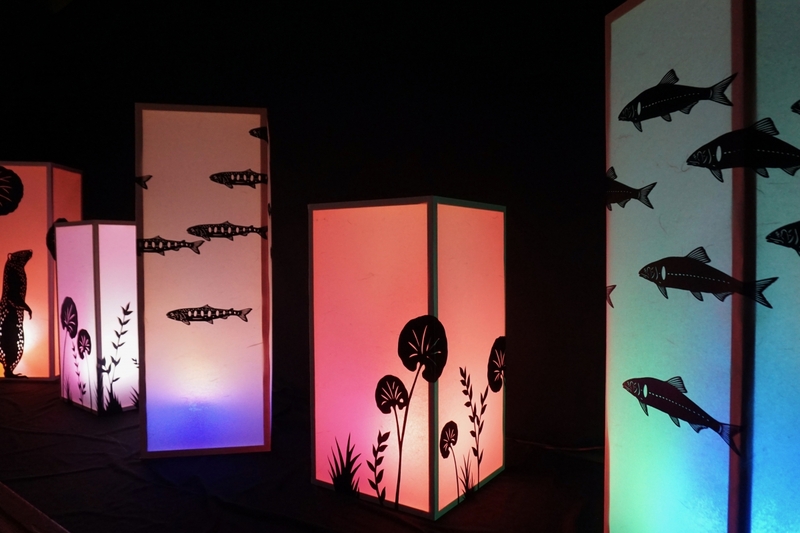 Lanterns decorated with paper cutouts by Teppei Hayakawa. Despite its modernization over the decades, Gajoen Hotel Tokyo, which has undergone many transformations under a succession of owners, remains true to Hosokawa’s aesthetic vision. Guests are bound to gasp at the sight of the elevators covered in garish inlaid shell designs and the extravagantly designed washrooms across the hall from the central lounge area and massive spiral staircase on the ground floor, described to us as “the 300 million yen toilets,” in reference to how much they cost. 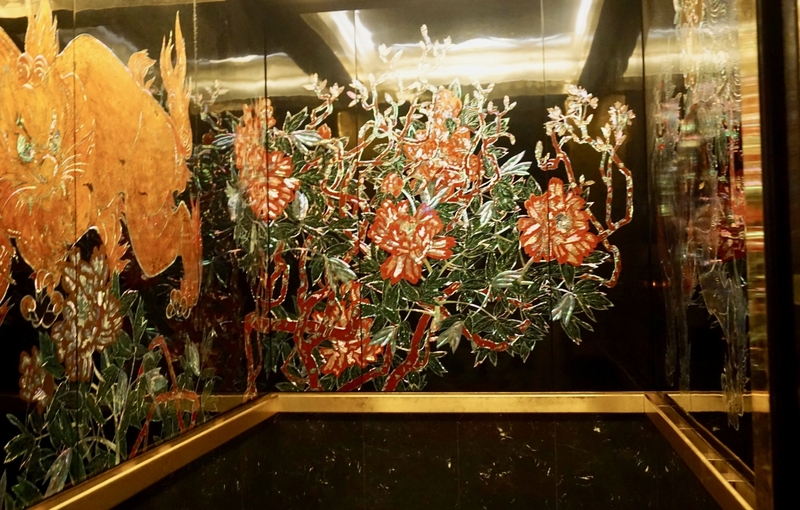 The interior of one of the elevators at Gajoen Hotel. The entrance to the ladies’ room of the 300 million yen toilets. 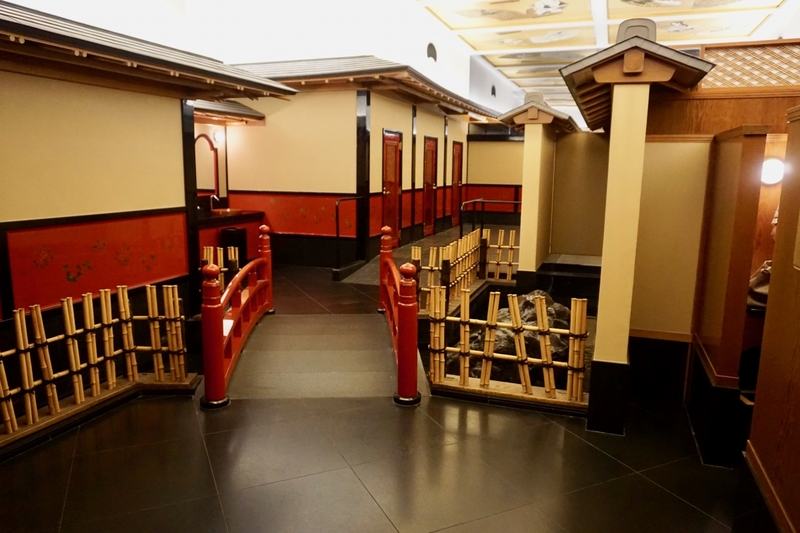 Inside the ladies’s room of the 300 million yen toilets. 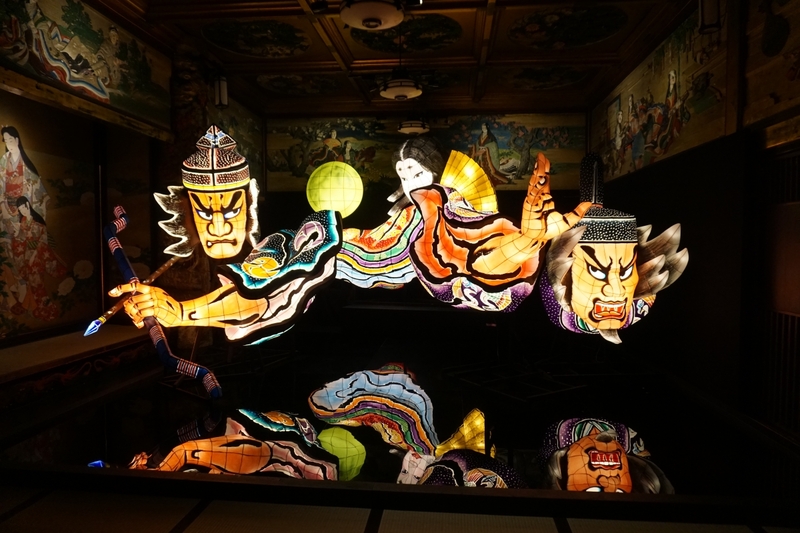 The “Wano Akari x Hyakudan Kaidan Illumination Festival 2018” runs until September 2 at Gajoen Hotel Tokyo. 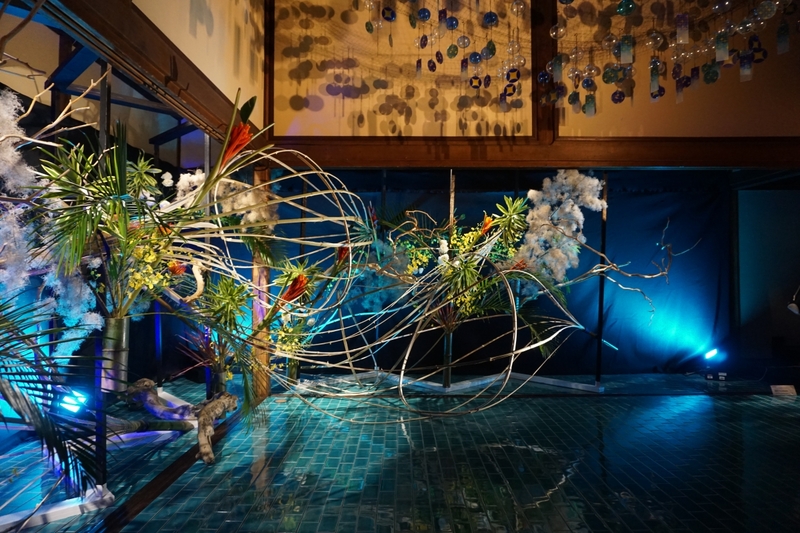 From September 21 until November 21 there will be an exhibition of ikebana, traditional Japanese flower arrangement, in the Hyakudan Kaidan area. 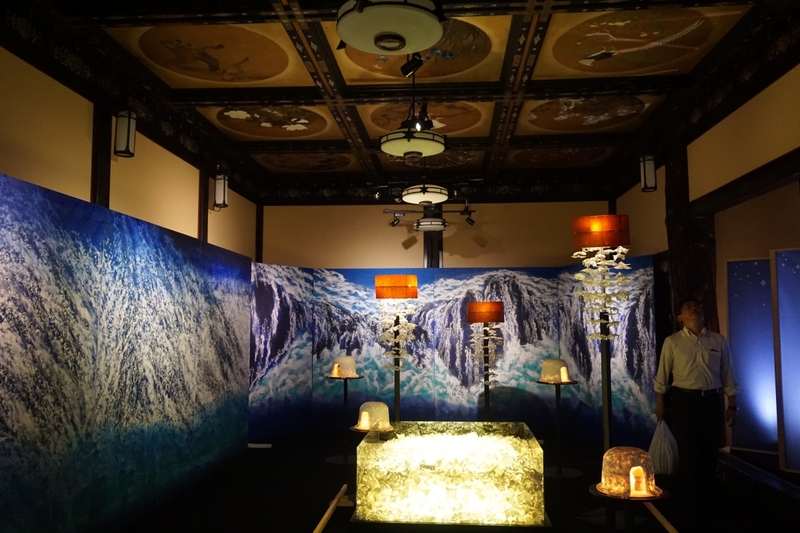 The Hyakudan Kaidan and its rooms can be viewed in their original state in the time between the two exhibitions. 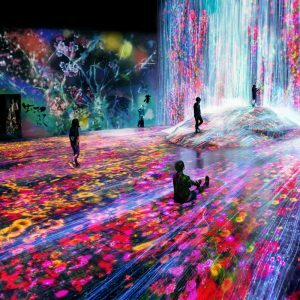 The general entrance fee to the “Wano Akari” exhibition is Y1,500. 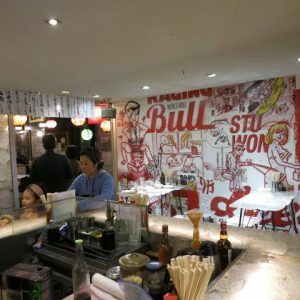 There is a guided tour (in Japanese ) for visitors having lunch or dinner at one of four restaurants in the hotel – American, Chinese, Italian and Japanese. See the website for details. Another option is to sign up for the “Dressing up in Yukata” plan, which includes being dressed in a yukata and accessories of your choice (which you can take home), tour of the “Wano Akari” exhibition, lunch or dinner and a gift of senko hanabi (small hand-held fireworks). See the website for details.